When you place an order with Sensory Treasures, as a customer you enter a contract with us and agree to our terms and conditions. For this reason it is important that you carefully read these terms and conditions before placing an order and therefore accepting them. These conditions will not reduce your statutory rights in relation to, goods which are faulty, unsatisfactory or described incorrectly. If you require further information regarding your statutory rights, you could contact your local authority Trading Standards Department or Citizens’ Advice Bureau. You are entitled to cancel this contract if you wish, provided that you exercise your right and notify us within 14 days of receiving your order. All orders placed on this website with Sensory Treasures through the payment process, will be followed up by a confirmation email. We reserve the right to refuse any offer to purchase and/or return payment. We like to provide a friendly, high quality standard of customer service which is of paramount importance to us…we want you to be completely satisfied with your purchases and the service you receive from Sensory Treasures. We endeavour to make this online shopping experience enjoyable, so that you want to return again. We are happy to hear from you and encourage feedback, including comments, ideas, recommendations, advice and product reviews, thank you. Please contact via email of telephone-details on each page of our website. As a customer, you have a right to cancel your order and return your goods to Sensory Treasures for whatever reason up to 14 days after the day of receiving your order. You must confirm your intentions to cancel your order by contacting Sensory Treasures by email, before the 14 day deadline, from the date you received your goods, before this time expires. Risk in the goods will pass to you, the buyer/customer, when the goods are delivered to, or collected by, you as the consumer/buyer, following payment in full. It is then your duty and responsibility to take care of the goods while in your possession, to return if necessary, in original packaging, and to take reasonable steps to protect the goods from damage whilst in transit. Sensory Treasures reserve the right to make deductions and charge for reasonable costs and expenses incurred as a result of you exercising your right to cancel, including opening the goods, damage to the goods, or use of the good. Your refund will be issued by the same payment method as your original payment, excluding the delivery cost of your order, the refund will be made within 30 days of Sensory Treasures receiving the returned goods. Any postage and packing cost incurred by you returning unwanted goods to Sensory Treasures will not be refunded. This is the responsibility of you the consumer/buyer. When returning goods to Sensory Treasures, please pack carefully to prevent any damage, enclosing your details. We recommend that you obtain proof of posting, which is free at any Post Office. Recorded Delivery is a chargeable service and secure. If possible to collect, this will be at a cost to Sensory Treasures. Please contact us by email to obtain our return address. We will endeavor to contact you before supplying substitute goods, for example, in some cases a product might be unavailable, we would substitute to the same value or more. Colours of some products may vary, however, remain the same value. Please examine the goods as soon as possible when you receive delivery. Contact us if you find any discrepancies within the 14 day agreed period. Contact us within the 14 day period to let us know of any fault or defect. Please appreciate that we cannot be held responsible for any damages caused by improper or extreme use, including over stretching, mouthing and biting. If you receive a delivery with damaged packaging, please take note of the delivery driver’s name, and contact us as soon as possible. Please examine the goods as soon possible and let us know of any damages within the 14 day period. We apologies if we have not delivered to your expectations. We aim to provide the best service we can. We would like to work together with you in order to try and put right any concerns. Please contact us, details are on our home page and listed above. All prices quoted are GBP £ sterling at the current rate. If this rate changes, we have the right to increase or decrease prices accordingly. All on-line orders require payment in full before goods will be posted. Payments can be used using all major credit cards through PayPal and/or through a PayPal account. We endeavour to dispatch your goods within 1 to 2 working days of you placing your order. Within 30 days we will inform you of any delays. Dispatch can be delayed during busy periods, such as Christmas, in this case allow 1-5 working days. You will receive notification if this is likely to exceed this time. Cost of postage is not included in the initial costs of goods. This will be determined by the size and weight of the goods ordered and will be calculated at point of payment. Please contact us as soon as possible if you decide to change your order. We will endeavour to make changes is possible. Sensory Treasures take the safety of our products seriously. A lot of our products conform to the European Safety Standard, displaying the CE Mark. These products are classified as being suitable for children over the age of 3 years and therefore identified as a choking hazard. Please be aware of this when choosing products to purchase, not all products will be suitable for every child or adult, especially for those who mouth, bite are vigorous or take things to the limit. You know your individual best. 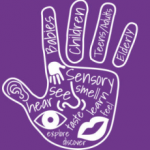 Under strict adult supervision, all Sensory Treasures products and sensory exploration can be enjoyed, supporting play, creativity and discovery. Treasure Baskets/Packs designed for stimulation all senses may contain household items. Adult supervision with this product is paramount at all times. Always check the contents/products for signs of wear and tear or damage before each use. Safety is our prime concern, please ensure your duty of care, observing health and safety guidelines, and common sense at all times. Any personal data that you provide, including completed bespoke forms will be held securely, in accordance with the Data Protection Act 1998. We will use the personal information provided by you for the purpose intended and agreed by you. We may send you emails concerning your order and information regarding offers and/or updates. You can chose to cancel at any time. Acknowledge and agree that all copyright, design, graphics, information are the property of Sensory Treasures and are protected as such.